1. Preheat the oven to 200˚C, gas mark 6. Prick the sweet potatoes with a sharp knife. Space out in a roasting tin and bake for 1 hour. Meanwhile, put the oil in a medium saucepan with 1 crushed garlic clove. Set over a low heat and cook, stirring, until the garlic begins to sizzle. Add the Cajun seasoning and tomato purée; stir-fry for 1 minute. Add the beans and their liquid. Season, bring to the boil and simmer briskly for about 15 minutes, stirring and crushing with a wooden spoon, until thickened and partially broken down. 2. Combine the tomatoes, 1 tbsp chopped coriander and ½ the lime juice in a bowl. In a separate bowl, use a fork to crush the avocado with the remaining crushed garlic and lime juice, plus 1 tbsp chopped coriander. Season both. 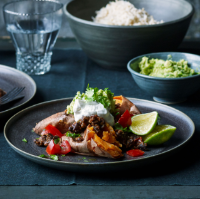 Split the cooked sweet potatoes open and fill with the beans, tomatoes, crushed avocado, soured cream or yogurt and the remaining chopped coriander.